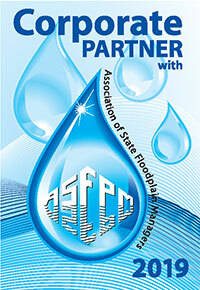 Flood Panel™ is your “one-stop-shop” for all your flood protection requirements. There is no single barrier or shield system to suit all flooding scenarios or site specific requirements. We carry a comprehensive range of products and systems that are the very best available on the market today. Below is a complete list of products that will cover most applications.Please see Total Solutions for more information and solutions to your project. 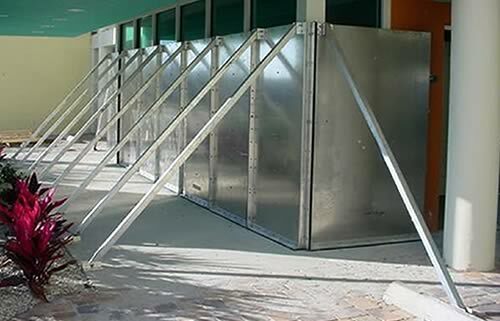 The Flood Log™ flood barrier system is a modular system designed to withstand high velocity water loads, as well as being highly resistant to heavy impact forces, and is particularly applicable to hurricane prone locations. It has a long and proven history as an effective flood barrier in all flood prone areas of the world, being one of the few system recognized by most if not all the larger insurance companies, not to mention governments that have the need for both large and small scale installations. The system itself can be installed either across specific openings or as a perimeter defense. The system comprises of ‘C’ shaped support posts and hollow aluminum beams, the ends of which mount (slide) down between the jaws of each post. These beams stack on edge with each other with a tongue and groove connection. Each beam giving a vertical height of 1ft, with maximum beam lengths of approximately 12ft. The bottom beam of each span (between posts) is fitted with a large rubber seal that makes contact with the foundation surface thereby achieving a water tight seal. No fixture points are required, making an extremely low (aesthetic) visibility system when not installed. The ‘end’ posts of a linear installation can also be internally mounted within the wall structure making it even more unobtrusive. This system can be supplied in almost any configuration from closed circles and rectangles to linear ‘straight’ runs of any length and a maximum height of approximately 19 feet. It can also be engineered accommodate slopes of 20 degrees, and be supplied a stepped format for greater gradients. Each application will be engineered to suit its site specific conditions optimizing the systems reaction time and effectiveness. Being a modular system it offers probably the lowest all important reaction (installation) time of any flood barrier system on the market together today. It also features user friendly storage characteristics. These design features together with its long and globally proven track record makes Flood Log the premier system of the manually installed flood barriers. The Flood Panel and Post System™ is a proprietary system designed by Flood Panel and Architecture Metals Ltd. Co. The system is a solid removable panel flood barrier, same as the standard Flood Panel System, but the design of this system does not require 45 degree support braces. The panel barriers are mounted on removable vertical posts, which eliminates the need for extra support. 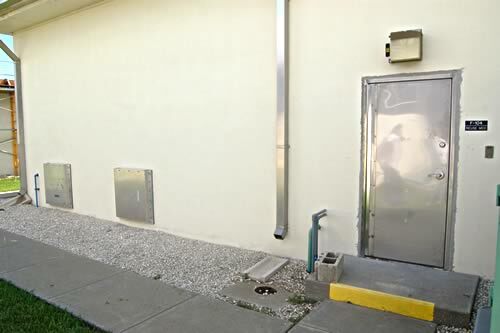 This system was designed to accommodate issues where the Flood Panel barrier needs to be installed close to the property line and are not allowed to extended beyond that line into the public sidewalks. This issue is very common in cities with storefronts. This system can be custom designed to suit more or less any wall configuration or site specific condition. 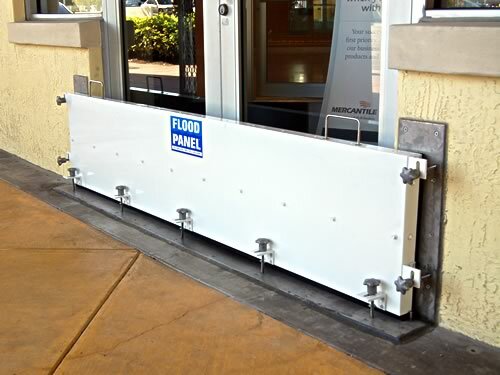 The Flood Panel™ system is a solid removable panel flood barrier or shield ideal for single or double door applications It is engineered to withstand hurricane forces and impacts. Each panel is specifically engineered to the full ‘designed flood elevation’ (height required), and is edged with a rubber gasket. The system can also be designed with embed mounting plates for the sill and jambs allowing for easy deployment. The embed plates are available in primed steel or stainless steel and can be painted to blend with the building color. Due to irregular conditions at some openings requiring flood mitigation, it becomes necessary to custom design a system to accommodate current conditions. Flood Panel™ has many years experience with custom applications. 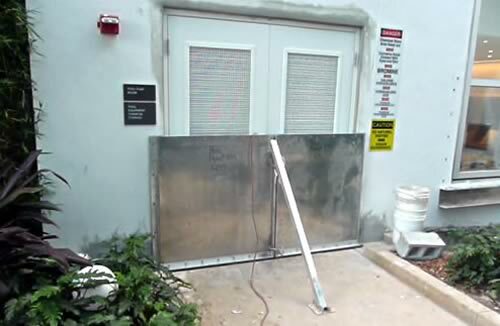 The Hinged Flood Gates are similar to our panel barrier systems except they are permanently installed at the opening location, and are effectively stored in their open position. This system can be custom designed to suit any width opening within reason and can be supplied in either a single or two leaf configuration. For larger gates central support, wheels can be fitted for safety and ease of deployment. Once swung shut and locked, an effective seal is created with no further interaction required. 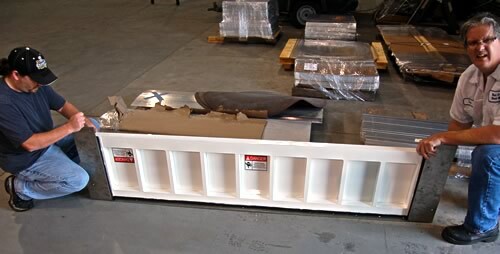 Because this barrier is permanently installed and stored at the opening location, it only requires swinging it closed to be fully installed to offer a very low reaction time. This is critical in the face of a threatening flood event. To reduce the aesthetic impact of this barrier the front surface of the gate can be colored or covered in a manner to suit or match the wall or structure it is mounted to. Puddle Panel™ is designed to be a quick reaction flood barrier system capable of withstanding low flooding. It is extremely effective in keeping flood water from entering doorways in a very quick and easy to install manner. Puddle Panel is a proprietary designed lightweight aluminum panel system that is edged with a thick rubber gasket that produces an excellent seal. 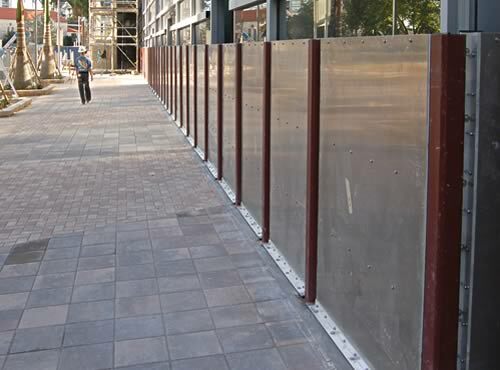 When it comes into contact with stainless steel mounting plate that is permanently installed around the opening to be covered, it insures a seal regardless of the building surface type or condition. The mounting plate is fitted with small locating pins which automatically aligns the anchor screws. The anchor screws are fitted with large handles for ease of installation. The mounting plate itself can be painted or powder coated to suit the buildings color, rendering it virtually invisible. Installation time for this barrier for either a single or double door is under 5 minutes even by a completely unskilled person. 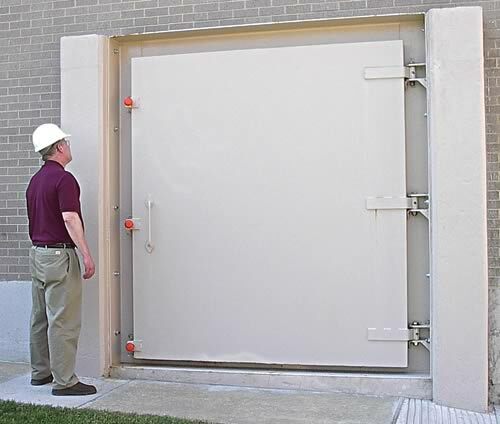 The Flood Door looks and works essentially like a normal pedestrian door, however it has been internally reinforced and has a mechanical sealing mechanism housed within the frame giving leak free seal when fully closed. 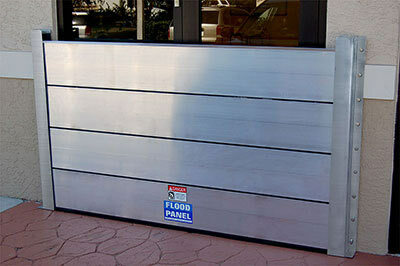 This means that the flood door is an active flood barrier at all times, day and night. This is ideal for flash flood and critical infrastructure locations not to mention all those looking for “no worry” flood protection. This product can be custom made in either steel or aluminum to suit any single door opening with the internal seal elevations to accommodate the clients flood elevations. The flood door can be fitted with a range of door Hardware from standard panic bars to specialized locking hardware and small glass view ports, etc. Architecture Metals designs, sources, installs and maintains high-quality architectural building products on commercial construction projects. 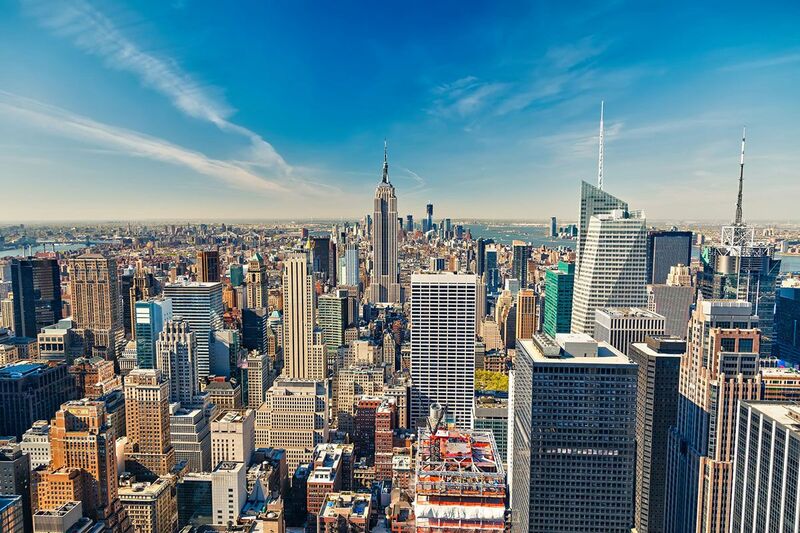 From design and specification assistance, to in-house project management, installation and service, we are committed to being recognized as your value-add partner on your design and construction teams. Please click here to visit the official Architecture Metals website and learn more about their products and services.